Transform two cake layers easily with our Sweetheart Cut-Up Cake. 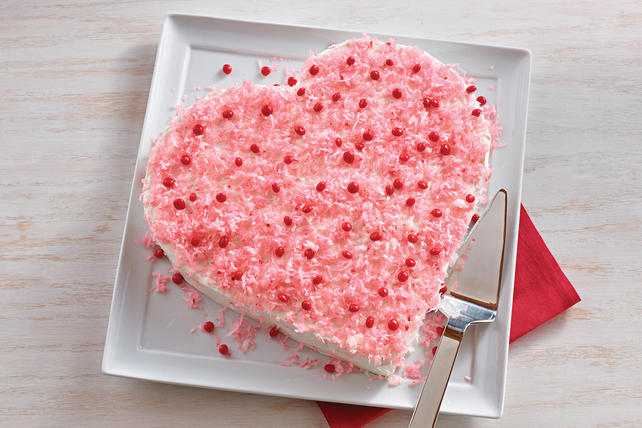 This heart-shaped cut-up cake is covered with COOL WHIP, pink-tinted coconut and candies. Grease and flour 1 each 8-inch-square and 8-inch round pan. Prepare cake batter as directed on package; pour into prepared pans. Bake as directed on package. Cool completely. Place square cake with one corner at bottom of serving tray. Cut round cake crosswise in half; place cut sides of cake halves next to adjacent sides at top of square cake to resemble heart. Use some of the Cool Whip to secure cake pieces to each other. Frost cakes with remaining Cool Whip. Tint coconut pink with food colouring; sprinkle over frosting. Decorate with candies. Store frosted cake in refrigerator. Place coconut in resealable plastic bag. Dilute a few drops food colouring with 1/2 tsp. water; add to coconut. Seal bag. Shake until coconut is evenly tinted. Add more diluted food colouring if a darker shade is desired.